Ironman Korea - Defining the Word "Determination"
This is part 2 of my Ironman Korea adventure, read part 1 first if you haven't already. Ahdont guessed it rightly, after the swim, I did not sit still. But this piece is not about me, but about those brave men and women out there facing up the Ironman challenge. While I was swimming William was overcoming the 180km bike trail with all the other Ironmans out there, the course is tremendously tough, after a relatively flat 80km, they had to go uphill on a volcano for 10km non-stop. The alternating downpour and sunshine conjured up a hot and humid condition. Eventually William got pass the worse volcano section but failed to meet the cut off time for 150km. Though he had been fighting hard for 8.5 hours and what a brave fight it has been! After the bike cut off, Alice took off for her first Marathon, she had been training hard for this big day and no doubt we would see her fly pass throughout the course. She started in daylight and came back in the dark, finishing her first marathon in 4hrs15mins. Another fine performance. While waiting for William to return, we stayed in the stadium plaza and watched the two leading pros Scott Green (Australian) and Hubert Hammerl (Austria) coming back from the bike trail and moved into the bike/run transition, it was at this point I found out what this sport is about. They had raced back to back for 4hrs45mins and moved into the changing tent within 20 secs of each other, 1.5 mins there were out again chasing each other on the marathon (Scott Green eventually completed the marathon in 3:22 and became the champion!). What a tremendous fighting spirit they have displayed. This is what an Ironman is about, keep tapping and tapping into your reserve and you will find an infinite supply. Defining the Meaning of "Determination"
After Alice had taken off and after William had returned from the bike section, I took William's racing bib and jumped onto the marathon course. I planned to run 28km and experience what was out there and I found the most moving picture I have seen in all the races I have been to. I cannot stress more of my admiration to these people. All the athletes were fighting through the torturing marathon course, almost half of them have reduced to walking, others were jogging in pain and few were lying on the side of the road, recovering from cramps or heat exhaustion. No doubt they were shattered, but they persevered. Everyone of them were defining the word "determination" in front of my very eyes. I saw Ho Chak, the representative of Hong Kong in the Nations Challenge, he had a bike crash earlier today and has sprung his ankle, yet he did not give in and was walking the marathon in extreme pain. I also met Gregory Burn, a para-atheletes racing with a "hand bike" for 180km and now pushing forward on a "wheelchair". He gave an "inspirational" talk to us the day before but the talk was nothing compare to the inspirational act he was achieving. Occasionally an athlete will chase up on me and used me as a pace marker, not knowing that my legs were fresh. I would stick my head up and ran in a steady speed, pushing my friend forward for a few extra miles. Solemnly I said to myself, "My friend, I had no right to be out here trotting on your race course, but if I may be your boosters in this few miles, that will make me proud for being here today." Let's dealt with my part of the race first, just to warn you, it will be painful. 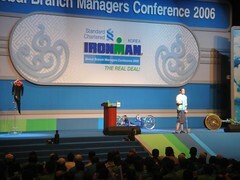 On the day of the Ironman Korea, I woke up before dawn, psyching myself up for the big day. I couldn't feel more ready, the wetsuit had been the final piece of jigsaw, it was very restrictive on the first two times I wore it in Hong Kong. But in the practice session the morning before I finally feel the wetsuit had been wore-in, I cruised through one loop of the swim course (I have to do two loops in the race) without feeling out of breath. 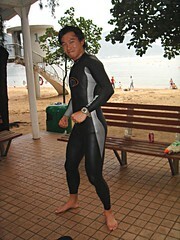 The wetsuit had really helped me glide through the water. Walking out of the hotel, the wind was strong and I knew it would be a rough sea out there. In fact the afternoon before, when I headed back to the beach, the wave had already been picking up. 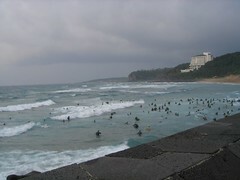 Descending the cliffside staircase to Chungmun Beach, I can see the swirling sea was brewing up a perfect surfing conditions. However none of the participants I met on the way were worried, in fact we were all eager for the challenge. This would make a perfect adventure, I thought. Soon I got into the my wetsuit and headed out for a warm up, I swam about 200m out and could body surf back on to the beach, literally punched a few people on their way out in a Superman position. Soon we gathered on the beach to wait for the start, at this point the sea was getting increasingly restless, the lifeguards out there couldn't even maintain their jet-ski and kayak in positions, the organiser delayed the start for 10 mins. 10 mins gone and we had no comfort but downpour, a few distant thunder and few gigantic waves that makes us wonder if we will survive the day. 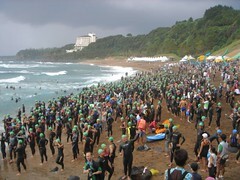 Then came the heartbreaking news, the lifeguard had declared the sea condition to be unsuitable for the race and they will cancel the swim leg of the Ironman, it would be a dualthalon. Brothers, you couldn't understand the pain it felt at the time, after 3 months of training and I am to play no part in the event. From that point Ironman has became a training camp for me, there were 12 unfortunately souls like me that day, most of them staff relay athletes, 6 of us gather back onto the beach half an hour later after the bikers have departed and we decided to finish the job that we come to do, even without lifeguards. Lead by a Chris Werner, a former German national swimmer and Ju Wei a current Singapore national swimmer, we charged into raging sea. A UK guy got hit by a wave and did a 360, he turned back after fighting through a few more waves. I struggled forward to keep up with the others, and after a while I completely lost sight of them. Swimming alone in an undulating water surface, I felt like a boat in The Perfect Storm. Well, that might be an exaggeration, but sometimes I was swimming upward and sometime I got thrown off a wave and slam face flat onto a trough. Eventually I felt less and less comfortable on my own and headed back. When I was back on the beach I realised I was out there for a full hour, and probably covered the distance of only half a loop. Michael the organiser of the Relay race was having a heart attack, as the other four is no where in sight. They eventually made it back 15mins later, a full loop completed. The two national swimmers headed out for their second loop. Well I couldn't come back and say that I did the 3.8km but at least I have been out there and took up a battle. Off to Korea, see ya! 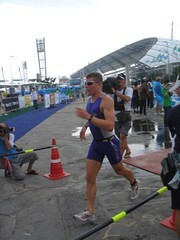 This is probably the last post before the Ironman Korea. Tonight I will be jumping onto the plane. I had great fun preparing myself for this event, and now I feel ready. I am looking forward not just to the 3.8km swim itself but being able to absorb the atmosphere of an ironman event, to rub shoulders with some of the most motivated, single minded and determined warriors in the world. See you after the race. I had nose bleeding of the century. Blood just keep running out nonstop until I plug a roll of tissue in my nostril. I was looking so stupid that the other guests in the hostel was stairing at me. The most stupid thing he did was to reverse the van on a very narrow highway with a cliff on a side. He knows nothing about reversing and the van ended up with two wheels dropped in a ditch. Luckily not on the cliff side. There was a water fall with water melting from the snow mountain. The locals says those are blessed if they go around the water fall three times. Of course, three out of five of us were stupid enough to do it. We were armed with Gore-Tex jackets and trousers but with the volume of the water fall, we were all soaked with icy cold water. With the aircon in fullblast to stop myself from sweating and a bottle of baby oil to grease up my limbs. Hence this becomes the saturday afternoon challenge for Martina and I. And we set ourselves in motion. to cover my shoulders, finally to do up the zip. It was bloody painful, the suit is so sticky and glues onto the skin, by then my whole body was sweating, and the sweatwas free flowing all over the floor. Nonetheless, I tried a few stroke of freestyle to test it out. It felt good. But then something doesn't feel right, the logo is upside down. Is this a rejected good or what? I log on the webshop again and found the picture to be somewhat different to my wetsuit. What on earth? So finally, to keep the story short, with air-con, baby oil and lastly some common sense, I squeezed into the wetsuit alright, and tried it out today in Deep Water Bay. More media coverage on our challenges, haha, soon I will be caught by reporters for drinking myself out in a pub in Northern England. I had a crap week last week, Thursday worked till 12pm and Friday worked till 10pm. Hence by Saturday, I felt so completely knacked, I hit the pool on early morning and knew instanly that it would be a waste of time. Did about 1.5km in total but could hardly pushing myself at all, taking long breaks between laps. 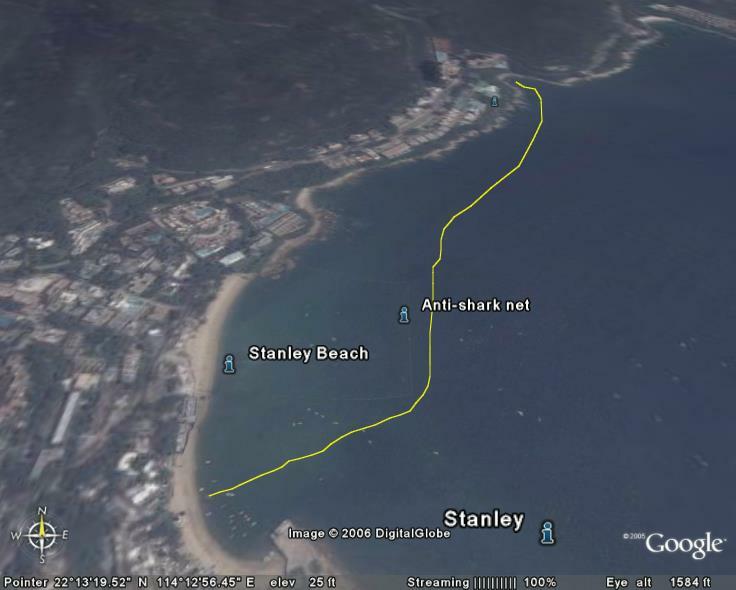 Then on this morning, Alain and Alice met me at Stanley Beach at 6:30am after their 20km run (yeah, they started at 4am) and paddled next to me while I swam openwater. I still feel rusty in the morning, but having companions for a change was motivating, especially being able to fill myself up with powergel and isotonic drinks out in the deep sea was luxury. In the end I swan from the windsurfing store out to the rocky beach underneath American Club and back, around 2.6km and 1hr20mins. That is only 2/3 the distance that I have to do in Korea, but consider the bad state I am in, I can probably still count on this morning as a confidence boaster. None the less, with only 2 weeks to go, I am begining to feel the nerve, most times I turned out overcoming the challenges but failures aren't unprecedented, Moganshan Race, also AXN Challenges 2004, Amazing Adventure 2003 were all incidents that I have screwed up. But then I have put so much effort this time, so let's just take a deep breath and take the dive! Haha, the Ironman Relay team is on the news yesterday. And we also got a can of ginseng from the CEO as a well wish. Isn't it nice to be a professional adventurer, I never even thought of that as possible profession when I was young, blame the education system of Hong Kong. So after the Gobi March, Terri Schneider, our adventure racer heroin decided to see a bit of Russia and France, it her own words, 'I think I'll go climb a moutain in Russia..... I may as well do a race there while I'm in Europe.' By that she mean climbing the highest moutain in Europe Mt. Elbrus (5643m) and then go an run the Tour de Mont Blanc, a 158km circuit around the Alpine mountain. What a harsh life!! Just had another session in the swimming pool today, while doing the drill, I timed myself for a kick only lap with my best effort, it was 1min30 sec. Then I timed myself for a crawl only lap with the kickboard between my legs, it was 1min. "Surely if I put the two together I must beat 49 secs!" I said to myself. So I threw the kickboard a side and dived into a full throttle lap. I hit the other side of the pool in 47 secs. That is another personal record! Of course, it is not a sprint but an endurance event ahead of me, so tomorrow, I will do a 3km open water swim, got my friends Alain and Alice kayaking next to me for protection. 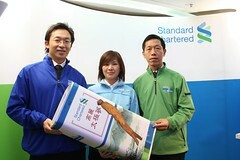 Organised by the Bank, my Ironman relay team had lunch with the two athletes that the StanChart is sponsoring to do the full length Ironman in Korea to exchange tips. They are June (left) and 何澤 (right). Amazingly June had only been doing triathlon for 3-4 years, before that she couldn't even swim a full lap in the pool. But now she is getting prepared for her second Ironman. 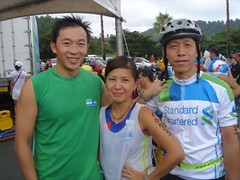 It all began when she got dragged into doing a relay for a triathlon for fun and she said she hasn't looked back since. Both athletes have got into these routine of getting up at 6 every morning to train for 2 hours and hitting the bed at 8pm at night (after a bit of trainning!!) whilst working a fulltime job. What awe inspiring people!! Though I question if I can make the same comittment, it might be three sports you are training for but it boils down to only for one single goal. But is this a goal that worth everything in life? I guess it comes down to what moments you define yourself "living", to them it certainly are those moments when they are fighting the pain.